Are you looking for a great double stroller to make traveling with your little ones easier? You need a durable stroller that keeps life on-the-go a breeze, especially if you’re juggling more than one child! We evaluated the best side by side double strollers on the market to simplify your shopping experience. Before we get started, let’s take a look at what you should look for before making a purchase. Type: You’ll need the best stroller for your lifestyle. If you’re active, you should take a look at joggers. For casual walks in the park with newborns, bassinet strollers are stylish and comfortable. 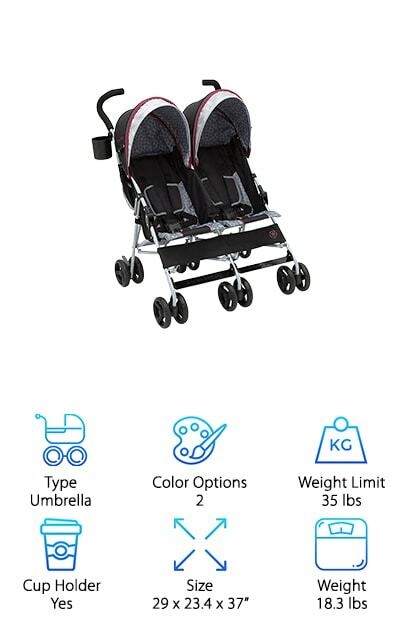 Umbrella strollers are great for babies as they grow. Check this spec to determine the type of each of our picks. Color Options: These days, baby gear comes in a wide range of colors and patterns to reflect your personal style. Whether you’re in the market for a classic black or white stroller, or you want something a bit funkier, we’ve outlined the number of color options available in each model. Weight Limit: Some strollers grow with you, while others are meant to suit different stages of infancy. You’ll need to know how much each model can carry, to be sure you end up with the perfect fit for your little ones. Check this spec to determine the maximum weight each stroller is capable of holding. Cup Holder: Don’t overlook convenience! If you’re in the market for a jogger, you’ll need a nice spot to store that water bottle. Likewise, it’s always helpful to have a place to put your coffee--especially if you’re a mom! We’ll let you know if the design you’re eying comes equipped with a cup holder. Size: Dimensions are important when considering storage. 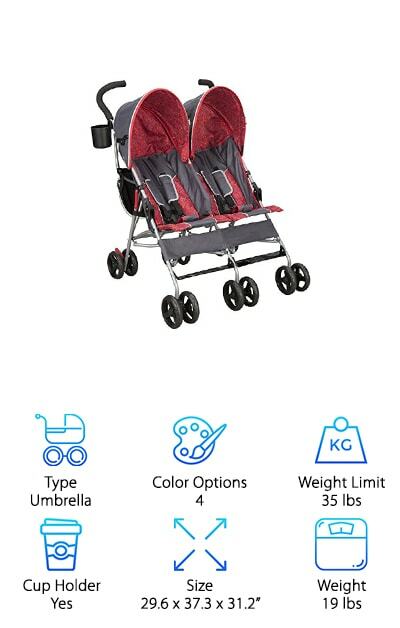 The total size of the stroller is indicative of both how much room there will be in it for your children and belongings, as well as how much space it will take up when not in use. We outlined the size of each model, so there are no surprises. Weight: Baby gear can be heavy, especially strollers. 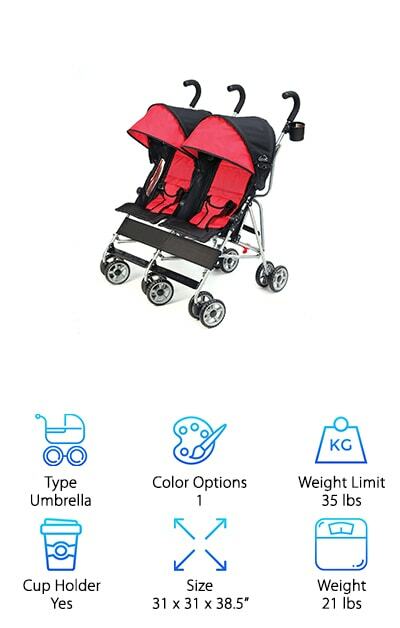 A side by side double stroller needs to be easy to assemble and hold each time you use it. Check this spec for the accurate weight of each model and keep what works in mind for you, because you’ll likely be using it quite a bit! Now that you know how to pick the perfect double stroller, it’s time to check out our top ten list. If you’re in a hurry, take a look at the top pick and budget pick first. Both are excellent products and some of the best we found. Right below, you’ll see eight other choices that are also sure to delight. If you’re looking for the best side by side double stroller, it’s on this list. Let’s get shopping! Landing the top spot on our list is the ZOE XL2 DELUXE. This super lightweight stroller is only 16 lbs, making it one of the easiest models on the market to maneuver and carry. The easy-fold design makes it the perfect traveling companion, especially for airport travel. And stopping your adventure for lunch has never been easier, either. Just fold the ZOE in half and store under your booth or next to the table. The best part? 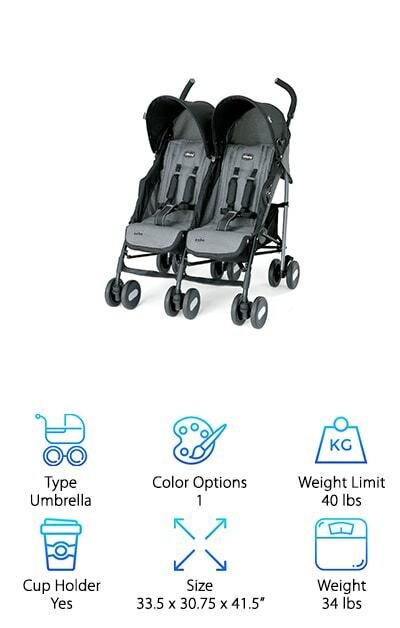 Its versatile design makes it useful as both an umbrella stroller and a jogger. Two 4-panel extendable canopies with peekaboo windows keep your little ones safe from the sun. The 135-degree reclining seats allow babies to rest or nap and the 5-point harnesses keep them snug and secure. And get this: the ZOE is equipped with a parent cup holder, two cup holders and a snack holder for the kids, and a large storage basket. Perfect for little ones up to 50 lbs, you get it at all and compromise nothing when you choose ZOE! Our budget pick is a quality product that comes to you at a super affordable price. The Delta double stroller is perfect for your two favorite little people. It provides protection from the sun and wind, thanks to two large canopies, reclines for rest and nap time, and folds up for easy, small, storage. The five-point safety harness features soft, padded shoulders, so your babies can ride in comfort. At a little over 18 pounds, it’s easy to travel with and even fits through a standard door frame! Enjoy your favorite latte, thanks to the convenient parent cup holder and store all your baby stuff and personal items in the two large, roomy back pockets behind the seats. Best of all, a 360-degree swivel shock absorbing design on the front two wheels provides a safe ride for your kids and keeps chop at bay, so you won’t lose everything. This wallet-friendly option is a must-see! Known for its tough, all-terrain styles, Jeep does not disappoint with its Scout stroller. Front wheels equipped with swivel and suspension make this design easy to maneuver through the grass and on the pavement. Each seat holds children weighing up to 35 pounds and two extendable canopies provide protection from the elements and the sun. The durable seats recline for a relaxing and comfortable ride, and the five-point safety harnesses are lined with a reflective material, so your kids can even be seen at night! Capable of holding two children weighing up to 35 lbs each, this stroller lasts beyond infancy. Four storage pockets located behind the seats and a parent cup holder keep this model at the top of the game for convenience. 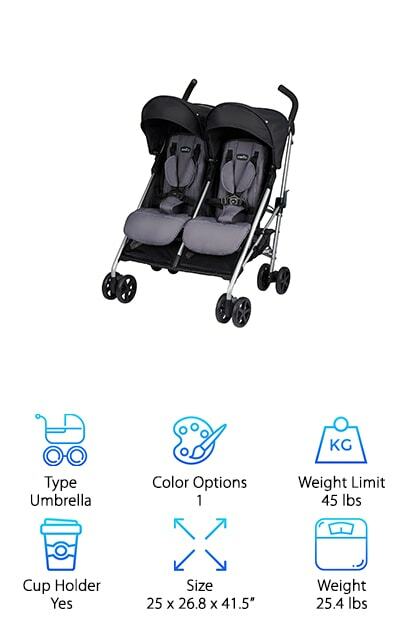 Super safe, comfortable, and practical, we think this side by side umbrella stroller would make the perfect addition to your baby gear. The two mesh pocket cup holders, two zip-closed pockets, and ample under-seat storage bring the Joovy Scooter to our list as one of the best strollers to take with you on trips or long rides. The zippered pockets are wonderful for storing keys and wallets because you can rest easy knowing they won’t go missing if you hit a bump! 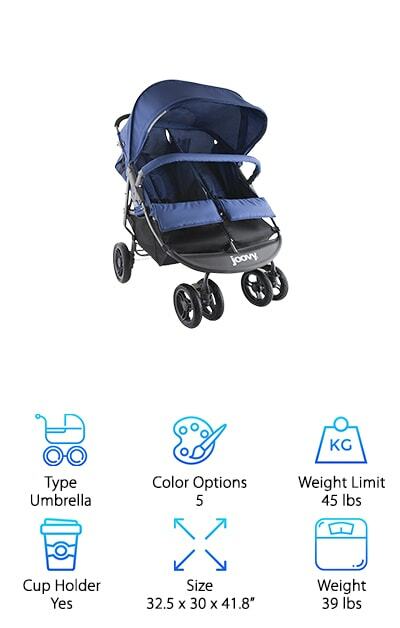 The Joovy Scooter accommodates two kids up to 45 lbs each, so the stroller will grow with you and last well beyond infancy. Each seat reclines and provides an individual foot rest, to provide maximum comfort for the separate riders. An oversized canopy offers maximum protection from the sun and wind. Easy to fold with one hand, this stroller follows a simple design and fits in most trunks. It also glides easily through standard sized doorways. Customize to your style preference with one of the five colors available. The Baby Trend Navigator helps you jog in style while keeping your precious little ones comfortable. The locking front wheels and pneumatic bicycle tires keep this stroller parked in place or moving quickly through different terrain. Padded reclining seats and a durable foot rest provide maximum relaxation for the riders, and the seats are designed to be compatible with two Baby Trend infant car seats. You can use this stroller from early infancy through the toddler years! The best part? Everyone gets their own tray! You enjoy a parent tray with two cup holders, MP3 speakers, and a covered storage compartment. The little ones also get a tray each, equipped with cup holders! The effortless trigger folding design means easy transport and storage of this stroller, so you’ll never feel put out by it. If you’re a mom or dad who loves to jog, you won’t want to miss this deal! The Kolcraft Cloud makes our list as an excellent option, thanks to its quality design and effortless strolling-- like floating on a cloud! At only 21 lbs, you can travel light and easy and worry about the kids, instead of lugging a heavy stroller to and fro. A convenient cup holder allows you to take your favorite drink with you, so you won’t go thirsty, while you’re on the move. Each seat reclines independently and is equipped with its own convenient folding visor to block out the sun and wind. Additionally, each rider enjoys a climate control roll-up seat back, which provides a cooling effect via air flow during hot weather. Padded three-point safety harnesses keep your precious cargo snug as bugs. The easy-to-fold design makes packing this model into the car or folding it up at your destination a breeze! And it won’t take up a bunch of room, either! Comfort is key with the Chicco Echo! Independent 4-position reclining seats with adjustable leg support allow each rider to tailor the experience for maximum relaxation. Dual adjustable canopies equipped with rear panels provide for extra protection from the elements. The embroidered charcoal seat pads are soft and pleasing to the eye, with a classic and elegant design. A set of dual front wheels with suspension and locking swivels keep your children safe from unexpected rolling. Even better, it folds into a compact, easy-to-carry design, complete with a handle. Traveling has never been easier thanks to the slim, convenient Chicco Echo! Enjoy the added benefit of sipping your favorite drink, thanks to the parent cup holder. 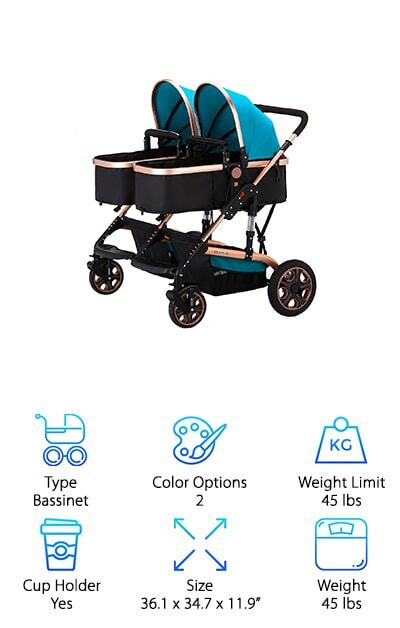 Able to hold up to 40 lbs in each seat, this stroller will last you from six months into the toddler years, making it well worth the investment! Evenflow Minno is a classy, premium stroller that offers maximum safety and comfort for your beloved set of littles. Available in dark gray and black, this stroller looks as good as it feels, thanks to its padded five-point harness and deluxe plush seats. Independent reclining seats and a two-position footrest keep each rider comfortable according to their own standards and make naptime a breeze! A front-wheel suspension and swivel-lock wheels ensure a smooth, cushioned ride and make the Evenflow easy to maneuver. Speaking of, the unique design allows for one-handed folding, so you always have a free hand to tend to your children. Take advantage of the parent cup holder and generous storage basket, which provides a spot for everything you’ll need! Able to hold two riders up to 45 lbs each, this stroller lasts well past infancy, making it a smart investment. 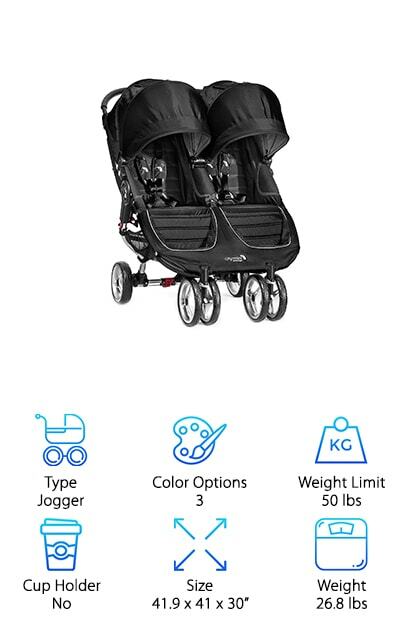 Travel in style and luxury and pick up the pace to a jog, whenever the situation calls for it with the Baby Jogger! This chic design weighs just over 26 pounds, fits through standard doorways, and even lets you steer one-handed! Called a “mini jogger,” you’ll never feel bulky or weighed down and will enjoy every added convenience that comes with this stroller! 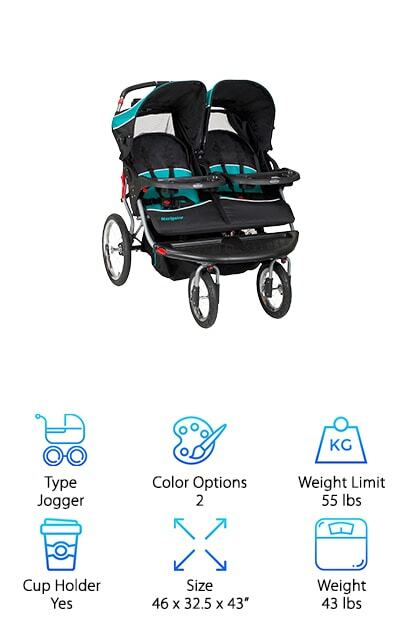 Capable of holding two children up to 50 lbs each, the Baby Jogger is a great option for infants, toddlers, and preschool aged children alike. If you have two little ones at home and are in the market for a versatile jogger, look no further. The reclining seats feature vents and a retractable cover, making them ideal for protection from the elements and also keeping kids cool and comfortable. Even better, car seat adapters allow you to incorporate your own infant car seats into the design! Finally, this awesome, premium model folds up for easy travel and carrying. The Yilaiboa makes our list as our favorite pick for bassinet-style double stroller side by side design. This beautiful model makes for an ideal setting when you have young infants and newborns who need to sleep often and are most comfortable laying down. The best part, though? 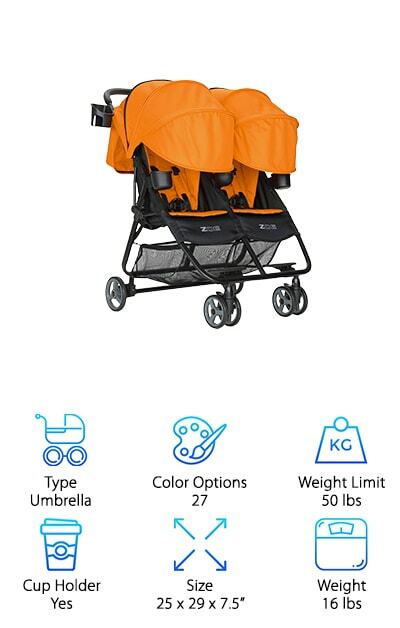 It transitions into a toddler stroller for children up to three years old and even provides a foot cover to protect little feet from the cold and wind. The seats are reversible, giving you the option to face your children or let them explore the outside world by facing forward. The front wheels swivel and are anti-shock and the back wheels are large, making it easy to maneuver various types of terrain and providing a smooth ride for all. The Yilaiboa conveniently folds into a small, tight design for optimum storage at home or in your car trunk. The best part? Enjoy a lifetime warranty on the wheels!